Private Equity Fund Formation: FundForm provides a comprehensive plug-and-play solution to legally forming your private equity fund. Most investors in private equity funds expect to see the fund setup as a Delaware limited partnership. Since a limited partnership needs to have a general partner, it is advisable for liability purposes to create a limited liability company to serve as the general partner of the fund. FundForm’s Comprehensive Private Equity Fund Package includes the necessary certificates, documents, and agreements to form both the fund and the general partner, along with comprehensive step-by-step instructions explaining how to handle every step. Confidential Private Placement Memorandum (the “PPM”): The PPM includes a description of the Fund’s investment objective and investment process, a summary of terms, risk factors, U.S. federal income tax considerations, ERISA and other benefit plan considerations and other relevant disclosure. Limited Partnership Agreement: The Limited Partnership Agreement provides the rights and obligations of the limited partners and the general partner of the Fund. Subscription Agreement: The Subscription Agreement provides the representations, warranties and covenants of limited partners investing in the Fund. Certificate of Limited Partnership: The Certificate of Limited Partnership is filed with the Delaware Secretary of State and forms the Fund. Form U-2: Form U-2 must be filed with each state in which the Fund’s limited partners reside. Form D: Form D must be filed with the SEC and each in state in which the Fund’s limited partners reside. Application for EDGAR Codes: This Application for EDGAR Codes is used to obtain EDGAR Codes so the Fund can file its Form D with the Securities and Exchange Commission (“SEC”) within 15 days of its initial closing. Certificate of Formation: The Certificate of Formation is filed with the Delaware Secretary of State and forms the General Partner. Operating Agreement: The Operating Agreement is signed by each member of the General Partner. Investment Management Agreement: The Investment Management Agreement is the agreement pursuant to which the Fund pays the management fee to the Management Company. Our documents have been updated within the last 3 months and they have stood up to the scrutiny of some of the largest and most expensive law firms in the investment industry. With our fund formation services, your satisfaction is 100% guaranteed. Top 3 Common Private Equity Fund Formation Questions: While we have many common questions answered within our FAQ section of the website, below are the top three most common private equity fund formation questions that we have received in the past. Question #1: We are starting a private equity fund. How should we set up the legal structure for this fund? Answer: The typical legal structure that the majority of investors in private equity funds expect to see is setting up the fund as a Delaware limited partnership. Since a limited partnership needs to have a general partner, it is advisable for liability purposes to create a limited liability company to serve as the general partner of the fund. FundForm’s Comprehensive Private Equity Fund Package includes the necessary certificates, documents, and agreements to form both the fund and the general partner, along with comprehensive step-by-step instructions explaining how to handle every step. Question #2: How long will it take to get the legal structure 100% setup and ready to go? Answer: If you hire a law firm to set up your fund, you are the mercy of that law firm’s schedule. Overworked associates have numerous clients to attend to and since you are a start-up client, you will not be their first priority. Most law firms take approximately 3 months to set up a fund but it could take longer depending on the complexity. You will also be billed for every word, call and email that your law firm associate works on since if they do not bill sufficient hours, they will lose their jobs. 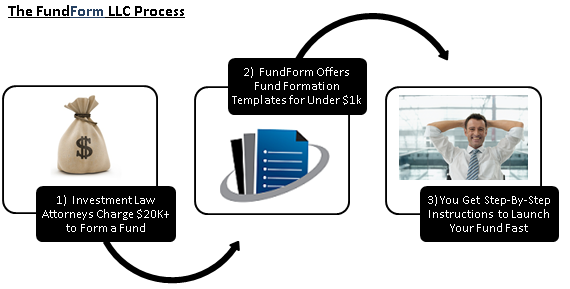 FundForm allows you to take control of the process and set up the fund as quickly as your schedule permits. Question #3: I need a law firm to be included in my fund documents because my investors require it. Can I still use FundForm documents? Answer: Absolutely. FundForm believes that start-up fund managers should be very cost conscious because the revenue of a fund manager is tied to its assets under management in the fund, which is an unknown variable. Therefore, we believe that a savvy start-up fund manager should purchase one of the Comprehensive Packages based upon the type of fund that it wants to create. Then, the manager should do as much work as possible and if they need to have a law firm involved, send the marked up documents to the law firm to minimize the billable hours spent by attorneys.